Authors and publishers need to understand copyright, because their livelihood depends on it. Copyright is a simple and effective way to protect creative works. Do you have a working knowledge of copyright? There’s still a lot of unnecessary mystery and folklore about how copyright works. Learn what you need to know about copyright quickly and efficiently. I keep hearing crazy stories about how people interpret—and misinterpret—our copyright laws. Understanding how they work is the best antidote. When you decide to publish your own book, you become responsible for taking care of the copyright registration and notice in the book. In this report I’ve gathered together articles on copyright to get you up to speed in a hurry. You’ll get the basics of copyright, and a whole lot more. What is CIP and do you need it? You’ll also find standard copyright pages that you can copy and paste right into your book. And I’ve included samples of different types of disclaimers you can use on your copyright page. Takeaway: If you plan to self-publish, or if you have questions about copyright, download this report and get the answers. Note: Clicking the Add to Cart button above will take you to a secure shopping cart and you’ll be able to download your report right after your credit card or Paypal account is verified. Your purchase is protected by my 30-Day 100% Money Back Guarantee. If you are unhappy with your purchase for any reason just let me know and you’ll receive a prompt and no-questions-asked refund of your purchase price. I personally guarantee it. About the Author: Joel Friedlander’s blog, TheBookDesigner.com, has become a leading resource for authors, publishers and designers on book design and the best practices for self-publishing. It has been named a top blog for writers by Writers Digest Magazine, the Alliance of Independent Authors and many others. His articles are featured on websites and in print publications including Writer’s Digest, Publetariat, The Self-Publishing Review, The RIT Open Publishing Lab and the IBPA Independent. He is an expert contributor for Amazon’s CreateSpace community, and as a trusted industry resource, Joel has been called “the best teacher for new self-publishers” on the internet. Joel, your teaching materials are tremendous help to me. They cover virtually every area I need. Your advice is a tremendous help to independent publishers but will help all authors who want their books to succeed. I cannot say enough about Joel. Every day I’m in awe at how he shows one how to make the self-publishing process simple. I have been able to go from being stuck and not knowing what to do with my completed manuscript, to having a well-prepared book that is ready for self-pub. My first book, The Book of Palms, just won the IPBA Benjamin Franklin “Book of the Year Awards” Silver Medal for 2011. Without Joel’s help my book would never have been published. Thank you Joel! I’m new to the self publishing arena and I find myself coming back to Joel’s website, information and vast resources time and time again. So you’ve written a book, you’ve published it—now what? If you’re lucky, you find out about Joel. He’s helped me avoid many of the pitfalls of self-publishing, from layout mistakes in ebooks to acting gauche while you’re trying to get the word out. Joel does a spectacular job of creating an overall perspective, combined with the best practices, details, examples, steps, techniques, etc. of the specific tasks that need to be D&D–either Done by the author or Delegated to someone who does it. I appreciated his ability to effectively teach to different experience levels, without overwhelming newcomers or boring experienced types. 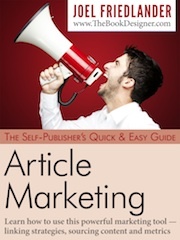 You have the most comprehensive and up-to‐date blog on self-publishing on the internet. I read you all the time and always learn so much. Thank you for the work that you do—it makes my life a lot easier. The clarity of your writing combined with the obvious insight is what I valued most as, to me, that seemed to be your most unique trait or value. Joel, thanks so much for your information which proved to be quite helpful starting out! It is so easy when you have an expert going along before you to ensure you’re making the correct steps. Joel, Your posts have become invaluable to me—I would not miss even one. Your information has expanded significantly the direction (and success) of our business. Keep up the great work! I have just begun receiving Joel’s blog. It is by far the most informative site for self-publishers that I have found anywhere. I look forward to receiving it each day. Joel is full to the brim with great information for authors of all kinds. I wouldn’t dare limit his knowledge to only those who want to self-publish. I think you’ll be impressed with the way his mind works and, not to mention, his calm approach. Joel is a fountain of useful information. And he is willing to share it time and again. If you go to only one place for help with your book, Joel’s web site should be it. Joel, your teaching is superb! Your blog is one that I have bookmarked and subscribed to. Not only do I get timely advice as an author, but your archives are full of rich, go-to info for every publishing issue I run across. Joel, your articles consistently deliver more comprehensive information than I could ask for. The publishing industry is fragmented and polarized as it rumbles through the biggest transition of our time, and you manage to straddle every issue. I’ve always found your articles full of wisdom; I never come away empty-handed, and considering I read an awful lot, particularly on the internet, that’s a solid compliment. Joel, when it comes to self-publishing there are very few who compare to the value, insight and clarity you provide. Yes, I bookmark many sites… but your site has a permanent hot-button on my toolbar! You’re that important to my success. Thank you. Joel, I can’t tell you how happy I was to find your blog. It’s been such a help to me! In a world full of “rah rah” and “you can do it,” it has been wonderful to find so much actual PRACTICAL advice on things most others don’t talk about.